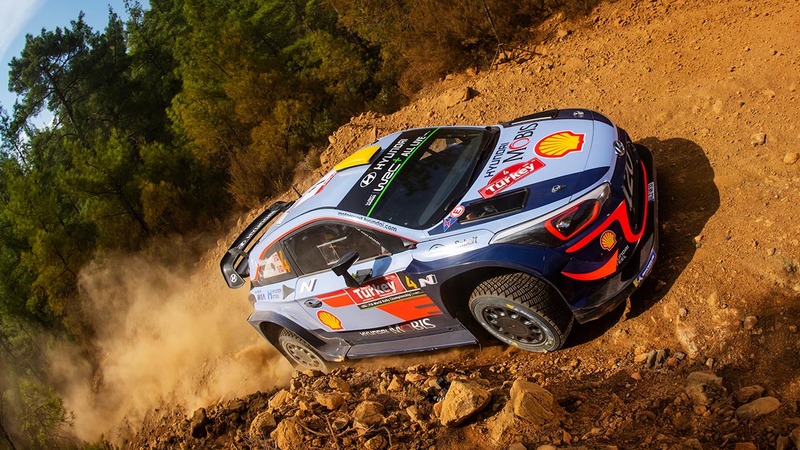 Championship leader Thierry Neuville held the edge in his Hyundai i20 over world champion Sébastien Ogier’s Ford Fiesta after a gruelling Friday on dusty rock-strewn tracks near Marmaris on the Turkish Riviera. That either was at the head of the leaderboard was a major shock given the handicap of starting first and second in the running order. Deep sand and gravel covered the roads, which both swept clean to leave more grip and a faster line for those behind. Belgian Neuville labelled his start position a ‘disaster’ but was inside the top six all day. He won two of the six speed tests and took the lead in the final kilometres when long-time leader and team-mate Andreas Mikkelsen lost vital seconds due to worn tyres. He overshot a bend in the last special stage but held off a determined Ogier. Like most, Ogier was hampered by hanging dust in this morning’s opening Çetibeli stage. He soared from seventh to second with a crushing performance to win this afternoon’s repeat, the longest test of the rally and one regarded as the toughest of the season. Mikkelsen was 2.3sec behind Ogier. He led after last night’s short curtain-raiser in the streets of Marmaris and regained top spot after losing it for two stages, before abrasive roads and temperatures exceeding 30°C took their toll on his tyres. Jari-Matti Latvala struggled for grip in the rougher sections in his Toyota Yaris but held fourth and was well in touch at 16.3sec off the lead. Team-mate Ott Tänak complained of similar traction problems but climbed from ninth to fifth in the final two stages. Craig Breen led for two stages in his Citroën C3 this morning but a flat tyre relegated the distraught Irishman to eighth. Elfyn Evans and Mads Østberg both retired in the penultimate stage with broken suspension. Evans lost time earlier with a differential oil leak in his Fiesta while Østberg’s demise ruined a strong performance which delivered third place this morning.